These are just a few of the items that I can have my paintings printed on! Hello dear readers as you know I’ve been doing some new paintings lately and with the wonders of the digital age you can have almost anything printed on almost everything. So I decided to see how these images would look on a myriad of merch. 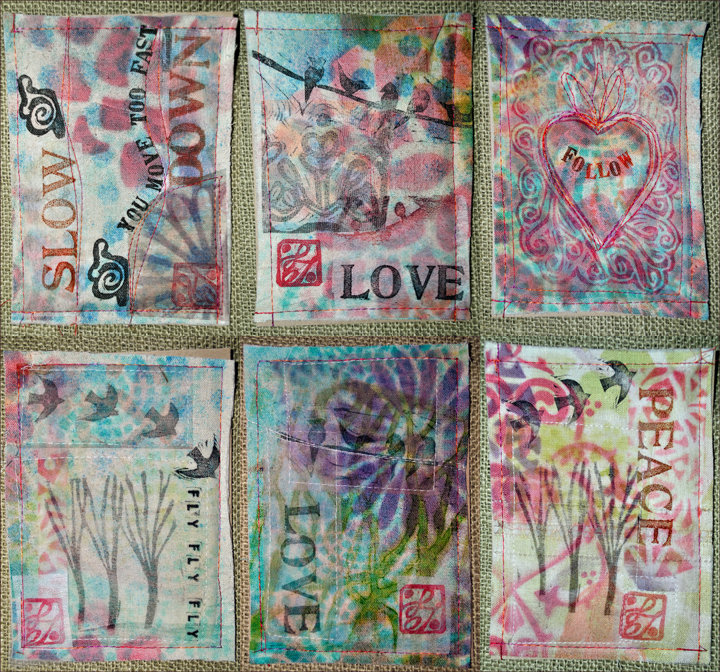 I uploaded my digital photos of these layered lovelies and look what I got – I love it! I ordered the Buddha printed on the tank top for myself- I thought you might love it too… follow this link then click on the painting you like and see it printed on everything from tank tops to phone covers…. really I mean it – check it out! I didn’t sleep very well last night so I almost talked myself out of my morning hike but I rallied after some oatmeal and a big mug of coffee to take a loop through the woods and out into a hilly clearing that provides vista’s to the east, west and south. The morning fog lay over the river and steam was rising from the dry grass hill as the suns rays warmed the frosted grey-brown grass. I sat on a near by bench facing the Northeast to watch and listen and breathe. The first sound I took note of was the distant road noise and marveled at the low hum. Then I watched the fog lifting its lacy fingers releasing the Russian river from its nights embrace, in the distance a murmur of starlings swooped across the valley and out of my line of sight. Then before I could see them I heard them behind and above, a rush of sound as blood and bone and feather worked to move wing and beating heart on and away out of sight again. The sun won the day- fog drifted, steam lifted and I rose by blood and bone and long limb to walk into my day. Strengthened by the reminder that I am part of the great net of life, one strand in the vast universe, one with the fog and the sun and starling. 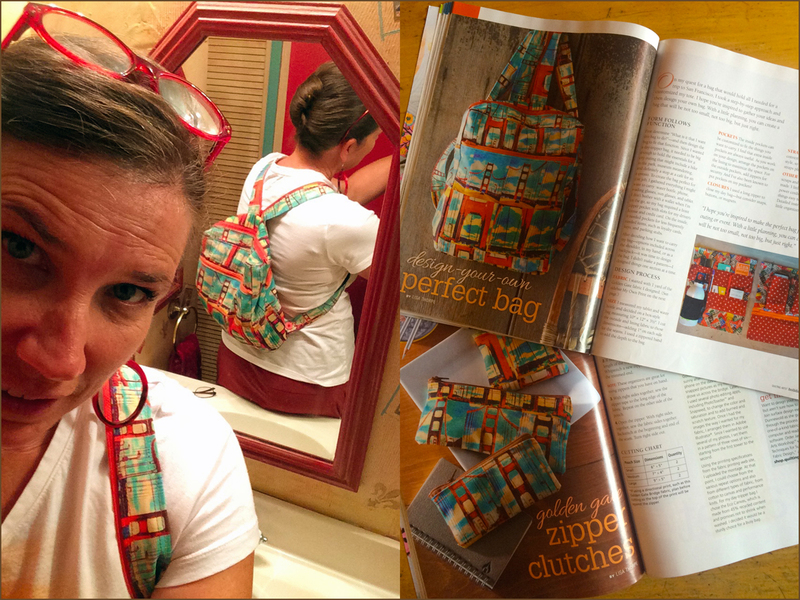 Here I am in an awkward selfie so you can see the backpack I made from my Golden Gate fabric on the left and on the right is the 4 page spread in this issue of Quilting Art Holiday! 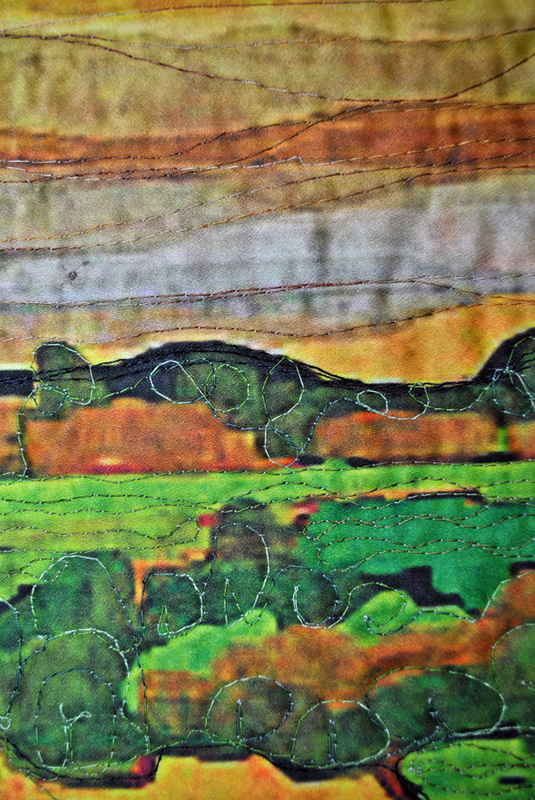 I know I showed you my Golden Gate Fabric a few months back but I’m excited to tell you that blog post lead to a spread in the latest issue of Quilting Arts magazine. The editor contacted me to see if I would like to contribute to the annual holiday gift issue. 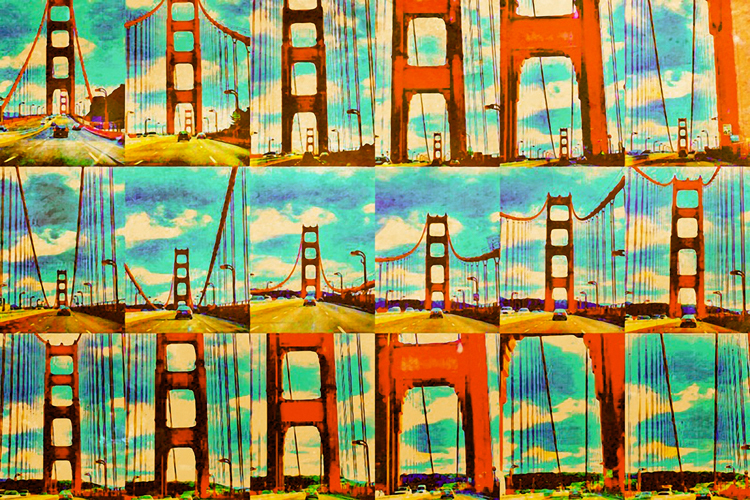 I wrote about how I make the perfect bag and printing your own fabric from photos like these fabulous Golden Gate Bridge images. This is just a quick post to link you up with some great sites. The internet now allows artists to create all kinds of things we never would have dreamed of before – sites like Spoonflower print fabric by the yard but not all of you sew or know what to do with a yard of fabric so I’ve uploaded to two site that have a vast array of products. My favorites are the printed scarves and leggings on Redbubble and the messenger bag and pillows on Zazzle. Check it out – I ordered a scarf for myself – I couldn’t resist! 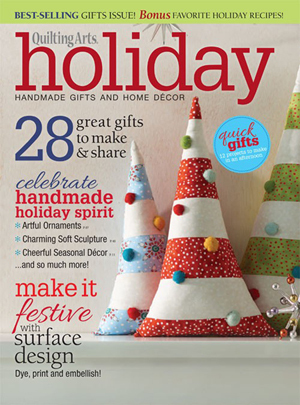 Pick up this issue, it’s filled with ideas and instructions to get going on your holiday gift making – or click the link below to buy a copy on-line. 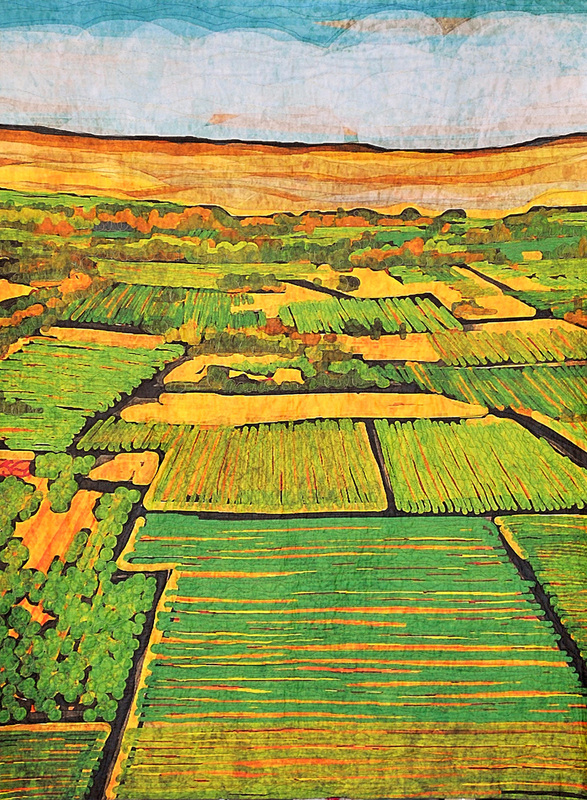 QUILTING ARTS – get your own copy of this issue! 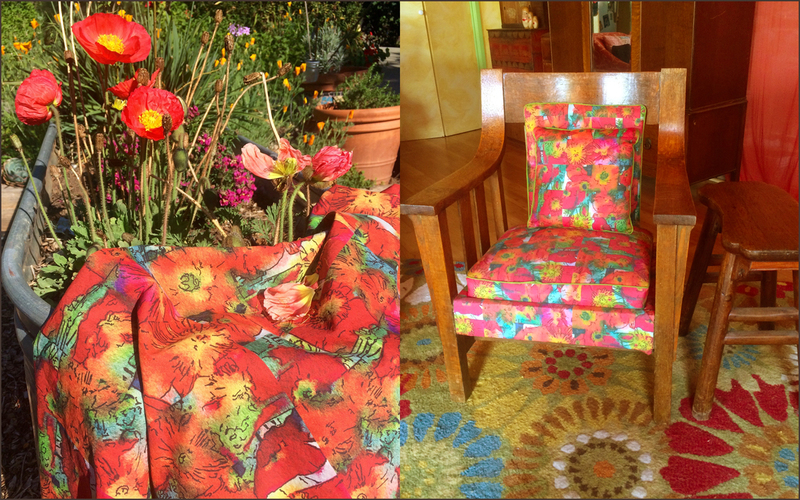 On the left are the poppies in my yard and the fabric they inspired. On the right is the chair I reupholstered. In late spring the red poppies in my yard were in full bloom. Every couple of days I would take a picture of a bloom or two on my iPhone. When I scrolled through my phone photo file later, it seemed to me these photos would make a great fabric print. I cropped and manipulated about twenty close-up poppy photos and created a grid of poppies. Then using the PS touch and Waterlogue apps in my iPad I got this great, brilliant watercolor bleed effect. I up-loaded my image and had the pattern printed at Spoonflower on canvas weight fabric. Just recently I recovered this old craftsman chair that sat in my grandparents house when I was a kid. It’s lovely to have a bit of family history and my own fabric flare all rolled up in one living room chair. I’ve got to say I love how the digital age has expanded all the ways to manifest creativity – and can’t wait to see what’s next, what new ways to combine technology, creativity and craft! You can buy this fabric and all my designs by the yard at http://www.spoonflower.com/profiles/lisathorpe. Spoonflower has a wonderful array of fabric they print on from delicate Silk Crepe de Chine to hearty Eco Canvas and everything in between. Check it out! Driving across the Golden Gate Bridge yesterday I snapped this golden pics! Yesterday afternoon I was lucky to be in the passenger seat crossing the Golden Gate Bridge, the sky was blue the bridge was orange and my phone was in my hand. I turned the camera on as we pulled out of the tunnel on the north end and started snapping. I wasn’t sure why – but once again I was trying to put myself in the way of beauty, in this case, to acknowledge the moment and capture it too! Today I opened the photos up and played with them in several photo manipulation apps (If you’re interested I ran the photos through Photoshop for iPad, Photo Toaster and Snap Seed). I love the power to capture and then manipulate a moment all right there in the palm of my hand! 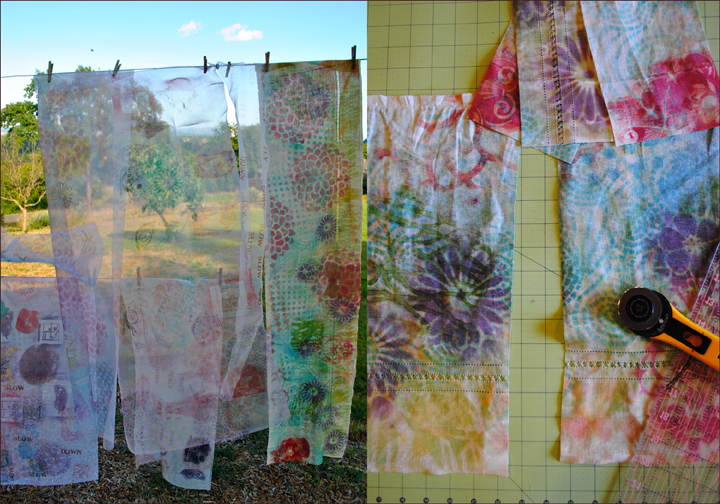 I already uploaded this montage to Spoonflower fabric printing service and my fabric will be in my hands in a few weeks…..I promise to post after I sew a fabulous dress or bag or whatever this fabric becomes!